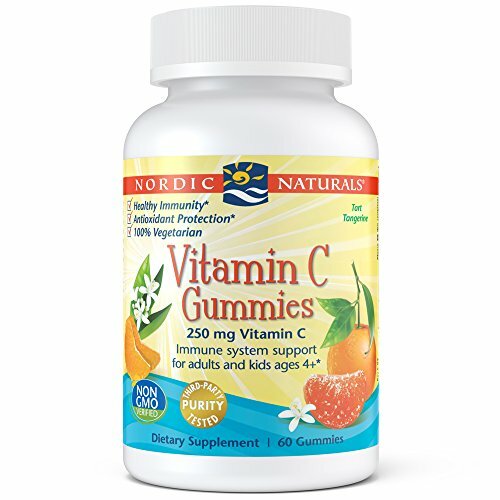 Nordic Naturals Vitamin C Gummies provides 250 mg vitamin C in each serving. Vitamin C is an essential nutrient that kids need for growth and development. These delicious, tart tangerine-flavored gummy slices are suitable for ages 4+. Grown-ups love them, too! NUTRITION FOR YOUR WHOLE FAMILY - Getting your vitamins shouldn't be boring! Kids love our tasty chewable Vitamin C gummies and you can feel confident in providing your child with high quality nutrition. Nordic Vitamin C Gummies provide Vitamin C for children, teens, and adults alike. Chewable vitamins are much easier to take than pills and your little ones will look forward to their gummies every day. Recommended for ages 4 and up. NO ARTIFICIAL INGREDIENTS OR PRESERVATIVES - Nordic Naturals places good health first. As a result, Nordic Vitamin-C Gummies have no artificial coloring or flavoring. They are non-GMO verified, gelatin, gluten and dairy free. To achieve this, our chewy gummies are pectin-based, and we use only sustainably sourced, natural ingredients to create a gummy vitamin C supplement without any fillers. DELICIOUS WAY TO GET VITAMINS - Just two Nordic Naturals Vitamin C Gummies contain 250 mg of Vitamin C with a yummy sweet and tart tangerine taste. It's a great start or addition to any dietary supplement routine. You will love the nutrition they provide, and your kids will love the taste. BENEFIT FROM ADDING VITAMIN C - At Nordic Naturals we believe in supplements to help you reach optimal health. Vitamin C is vital for growth, development and repair of all body tissue. It is also involved in many body systems including your immune system, which fights off infection. * All ages can benefit from increasing their Vitamin C intake. And what better way than with a gummy!